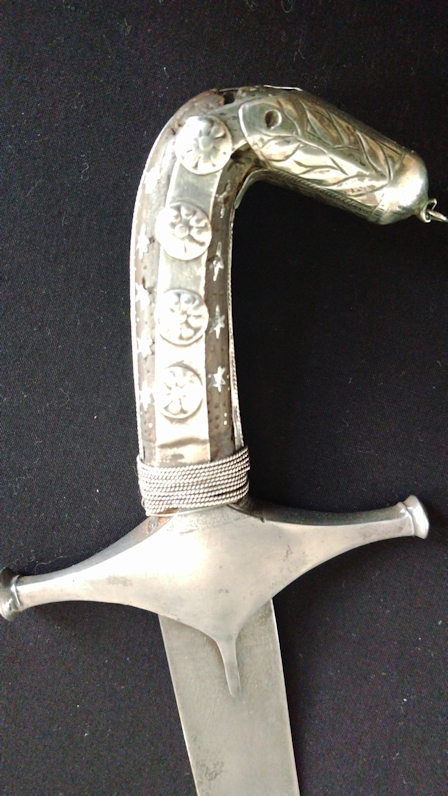 Early 19th c Indo Persian Scimitar, 31 inch single edged, curved, watered Damascus steel blade. Steel disk ended cross-guard with double langets. Polished wooden grips with inlaid star and stud decoration. 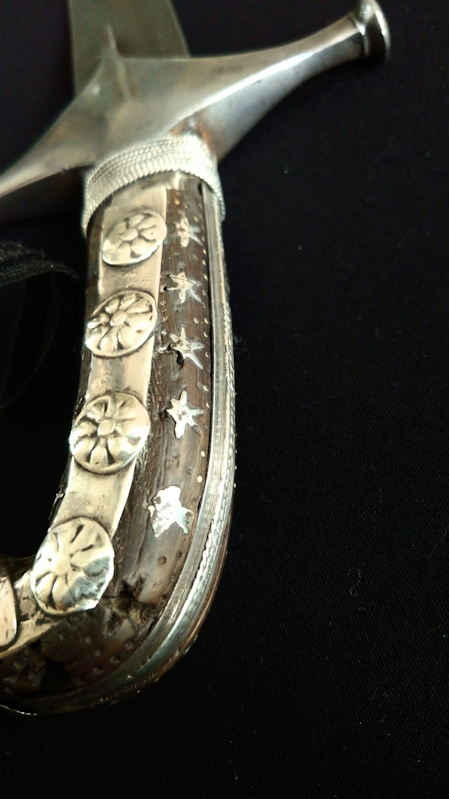 Silvered disk decorated slab overlays leading to the silvered floral decorated cap pommel. Base of grip with twist silvered wire binding. Length overall: 36'' (91.5cm) Blade: 31'' (79cm) measured across the arc of the blade. Profile taper: 1.23'' (31.4mm) at ricasso, 1.08'' (27.4mm)at mid blade, 0.58'' (14.7mm) 2 inches from tip. Distal taper 0.21'' 5.3mm) at ricasso, 0.15'' (4mm)at mid blade,. 0.09'' (2.2mm) 2 inches from tip. 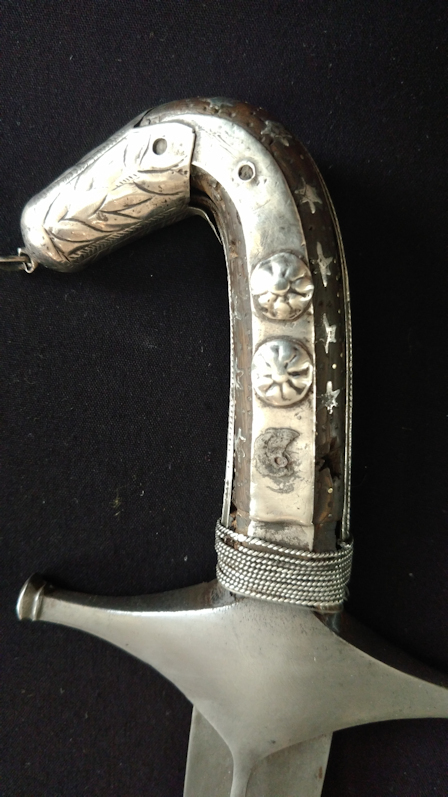 Hilt missing some of the stud and star decorative inlays and two of the silver rosettes. Metal appears to be silver or an alloy thereof, not silver plate. I think the description "watered Damascus steel" is a bit poetic. 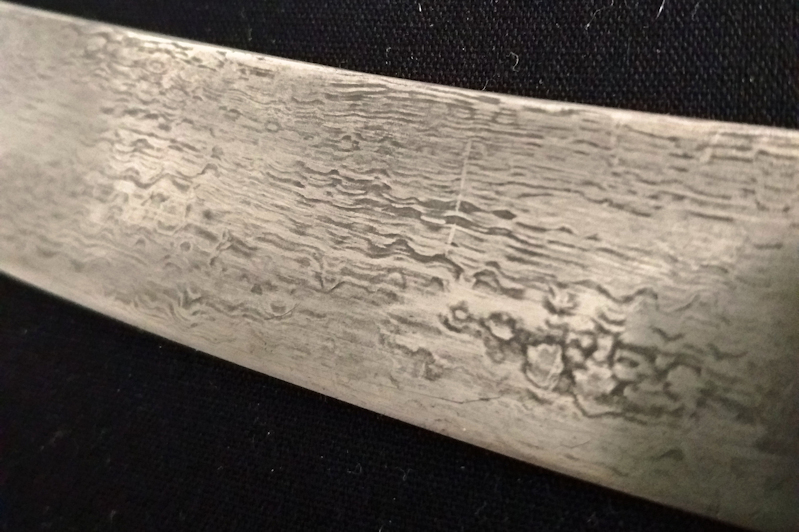 I wouldn't know wootz if it bit me but I feel fairly confident to describe this as mechanical damascus or pattern welded steel. I have used a weak solution of ferric chloride to bring out the pattern. The early 19th-century date may also be a bit optimistic, I would think late 19th, early 20th century. Anyway please feel free to chime in, I welcome any and all suggestions/comments, particularly as regards terminology, origin and date. 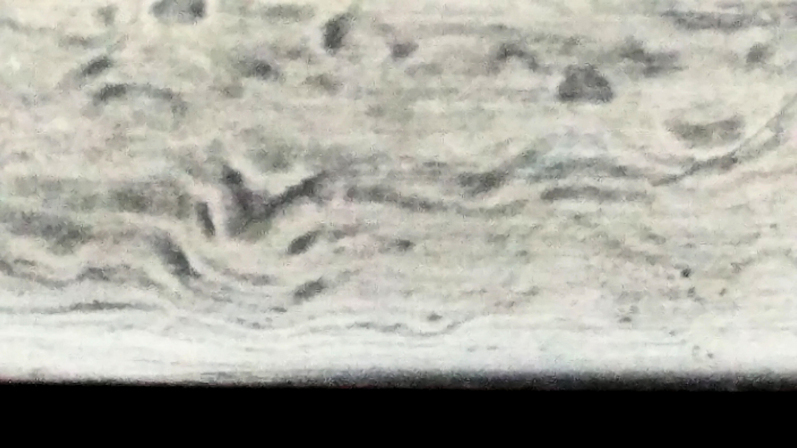 I agree that this probably isn't wootz: it is way too linear and "layery", it almost looks like some sort of sandstone or stromatolite, something which, as far as I know, never happens in a crucible. But I can't help you dating the hilt. I have seen several examples of Solingen pattern welded blades supplied to Arab and North African customers, and hilted in their own cultural style. This could be a 19th Century German blade that mades its way to the Middle East and was hilted there. This link to a youtube video on Scholagladitoria by Mat Easton showing how he cleaned and revealed a wootz pattern on a saber. I am not necessarily recommending cleaning the blade and doing the same thing if you don't know what you are doing, but the video does explain a lot about wootz and towards the end of the video one can see the pattern reasonably well, although it's probably harder to see on a video that up close in real life. Matt has a few other videos dealing with wootz that should should be able to find with a site SEARCH. I'm not sure but I don't know if your sword is wootz or pattern welding, but I'm betting on pattern welding or an artificially etched blade made to look like pattern welding ? This doesn't mean that the sword isn't authentic as this was sometimes done for aesthetic reasons. It may very well be pattern welded, I'm just suggesting options, and it's hard to tell from a pic. Since you already used some ferric chloride you already know about the method used by Matt in his video: Not sure how much cleaning is wise to do with an antique as it can at times reduce value if the cleaning is too aggressive ? Thanks all. I'm probably not going to do much more in the way of cleaning. I am now pretty sure it is pattern welded. I think if the pattern was just etched on then using ferric chloride would have removed or altered the pattern rather than just making it stronger as it did. I did get a suggestion on another forum that it was something called sham wootz, which is apparently different from false wootz. As I said I will settle for pattern welded. In fact I attach here a photograph of an Imperial German Navy Officers sword blade, made of hand forged 'Damascus' steel in Solingen between 1890-1914. Of course what the German wordsmiths called True Damascus, or Echt Damast, was actually pattern welded steel, and very beautiful, but not the same as Wootz 'Damascus', or crucible steel blades. Anyhow, I am pretty sure that this Arabian style hilted sword has a nineteenth century pattern welded blade made in Solingen Germany. Those Solingen blades did get about a bit, didn't they!